Today we’re going to talk about how you can tell the difference between metatarsal stress fractures, Morton’s neuroma, plantar plate sprains and osteochondritis. In previous episodes we talked about the different causes of pain in the ball of the foot in runners. We talked about the differences between Morton’s neuroma, plantar plate sprains, and osteochondritis. But a great question occurred to one of our listeners. Why didn’t you include metatarsal stress fractures in this series of discussions? After all, the metatarsal stress fracture can also cause pain in the ball of the foot in runners. So today we’re going to talk about how you can tell the difference between metatarsal stress fractures, Morton’s neuroma, plantar plate sprains and osteochondritis. Each of these conditions actually involves a different structure. A neuroma is a nerve injury. A plantar plate injury is a ligament injury. 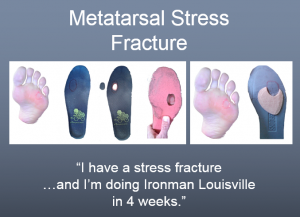 Metatarsal stress fracture is a bone injury. Osteochondritis is a cartilage injury. Of course, each of these tissues is located in a slightly different location. Granted portions of all of these tissues are located within the general region of the foot we describe as the ball of the foot. But they are different. Most running injuries are really not that complicated. The pain hurts when you press on or otherwise aggravate that particular tissue that is injured in that particular location. For example, a metatarsal stress fracture will most often hurt the worst when you press directly on the area of injury to the bone on the top of the foot. Patients often become confused because when they stand up on their toes and apply a lot of force to the ball of the foot they also have pain if they have a metatarsal stress fracture. But of course this is just because you’re applying force throughout the entire metatarsal bone. You’re standing on it! In a similar way when you stand up on the ball of the foot you can also feel pain if you have a neuroma, osteochondritis or a plantar plate sprain. The key with determining the correct diagnosis is to make sure that you are stimulating pain in a way that helps you determine whether or not you have one condition versus another. Standing up on the ball the foot can make all of them hurt so that doesn’t really tell you anything in terms of which injury is causing the trouble. If you can attempt to bend the metatarsal and elicit a painful response then you most likely have a metatarsal stress fracture. 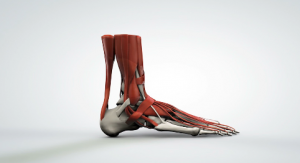 If you stretch the plantar plate, without touching any of the other structures and it causes pain, then you most likely have a plantar plate sprain. If you compress the cartilage inside the joint and it causes discomfort, then you most likely have osteochondritis. 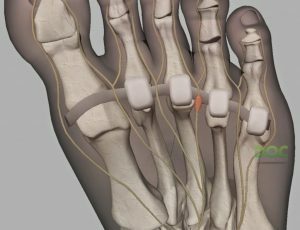 And of course if you compress the nerve between the metatarsal bones and it causes burning, tingling, radiating pain up toward the arch or out into the toes then you most likely have a neuroma. In order to test each of these individually you just have to understand the nuances of the anatomy. That can be complicated, but to simplify it, we actually created an entire self-diagnosis course that has 3-D animations, illustrations and actual videos of patients’ self-examinations to show you how we tell the difference between these conditions. When I do virtual doctor visit appointments via web conferencing, or when I do a phone consultation for an injured runner overseas, I often send these videos and animations to help them understand the differences and arrive at the correct diagnosis. Some activities will make certain conditions worse much faster than others depending upon which condition you have. If you have osteochondritis, the problem is in the joint, so it hurts if you move the toes. Doing workouts on an elliptical trainer or anything that involves a lot of bending of the toes can really irritate the injured joint because you’re grinding away at the injured cartilage. But because the joint really only hurts when you moves the toes, it is sometimes possible to run if you can just do something to limit the amount of motion in the toes when you run. Taping the toe or using shoes that have a stiff forefoot rocker in the sole may allow you to run without any pain at all. But that would definitely not be true of a metatarsal stress fracture. Taping simply won’t help. You have to reduce the stress in order to reduce the discomfort. So although you can do certain things to run you have to focus on relieving the amount of stress and strain on the metatarsal specifically to get it to calm down. If you have a nerve issue and you added a metatarsal pad to shift the pressure away from the injured nerve it may start to improve quickly. But if you do this with a metatarsal stress fracture it can actually move more force to the injured part of the metatarsal and increase your discomfort. Sometimes the way a patient describes the pain will help the doctor determine whether or not it’s one condition versus another. If you say you have an aching or throbbing sensation in the ball of the foot that description will lead most doctors to believe you have some sort of musculoskeletal injury. It’s probably either the bone (such as a metatarsal stress fracture), a ligament (such as a plantar plate sprain), or a joint injury (such as osteochondritis). However, if you say you have burning, tingling, radiating pain or some sort of electrical sensations then the doctor will almost always think that you have a nerve issue. One of the things will help you rule out some of these conditions is whether or not you have swelling. If you do have swelling, the exact location of the swelling can also tell you a lot about which structure is potentially injured. Although a nerve can swell when it develops a neuroma, the amount of swelling is so miniscule that you’ll never see it on the surface of the skin. So if your foot hurts and you have no swelling whatsoever you might have a neuroma. But that’s not a guarantee. The flip side of that is that if you have lots of swelling it is unlikely that a neuroma is at the root cause of your problem. Neuromas just don’t cause that much swelling. However when you get a metatarsal stress fracture you can develop lots of swelling. That swelling is most notable and most prominent on the top of the foot. What you have to do is put your feet flat on the ground and compare them side-by-side. When you do this you can compare the veins and the tendons on the top of the feet. If you’re injured foot seems to have veins and tendons that are much less prominent and much harder to see then you’re non-injured foot, you may well have a metatarsal stress fracture. When you get osteochondritis, the toe itself seems to swell up a lot. So if you have pain in the second toe joint at the ball of the foot and your second toe is really swollen then you may well have a problem with the cartilage or joint surface, such as osteochondritis. When you have a plantar plate sprain the injury is on the bottom of the foot. It’s underneath the base of the toe. So if you have pain in the ball of the foot at the base of the second toe and it seems like you have swelling on the bottom of the foot, it’s more likely that you have a plantar plate sprain. Sometimes with a plantar plate sprain the swelling on the bottom of the foot happens in a way that is asymmetric. The swelling bulges out more on one side versus another. When this happens it can actually make the toe deviate from one side to the other. 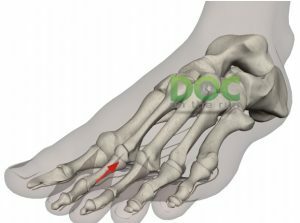 So if you have some swelling at the base of the toe, the pain is on the bottom of the foot and the toe seems to be slightly crooked compared to your other foot, you should investigate very closely to see whether or not you might have a plantar plate sprain. We sort of touched on this a little bit earlier when we’re talking about the aggravating factors. The way that you move a tissue or stress that tissue can help you determine which structure is really injured. And along those same lines the treatments for each of these conditions can vary slightly. Believe it or not, although doctors don’t ever share this with you, when a doctor tells you to try one treatment and come back in a week or two she may still be trying to arrive at the correct diagnosis. But understanding what helps a condition heal, or doesn’t help at all can help any doctor figure out what is wrong with you. Part of the reason I have such great reviews and have had so much success with second opinions for injured runners is that I actually often have more information available to me than most of the original doctors these injured runners had seen. It’s not that I’m smarter or more talented or clairvoyant, it’s just that I have more information at my disposal. All of those failed treatments help me figure out what his really been going on, and why this runner really can’t seem to get fully recovered and back to training again. Each of these conditions may improve at different rates. What I mean by that is some conditions will get better very quickly, depending upon what you do, and some of them will simply take a long time to heal. For example nerve issues typically take longer to calm down than an early stage stress fracture. What you do to help one of these conditions can dramatically affect the speed of healing. Yesterday I actually saw a patient who happens to also be a physician. He had developed a metatarsal stress fracture. Of course, he wanted to get back to running and training as quickly as possible. Being both a physician and a runner he asked three key questions. 1. Can I run with the stress fracture now? I personally believe that if it’s possible to run and not make the injury worse then you can run. If it’s possible to run with some slight modifications that allow you to continue to heal then you should definitely run. The only exception to this rule is if you have a specific time line that requires you be completely healed so that you can further ramp-up your training in full preparation for your key race. In that case you might actually need to do some more aggressive things to fully heal the injury so you can get back to more aggressive workouts that will build your fitness for maximum competitiveness. Here are couple of examples. If you’re six weeks out from the Boston marathon, and you been trying for your whole life to qualify, I think it would be a really foolish thing to wear fracture walking boot for six weeks and then try to run the race, right after six weeks of immobilization. But if you’re six months out from the Boston Marathon you may need to wear fracture walking boot for a very brief period of time to jumpstart the healing so that you can then effectively ramp up your training in full preparation for the race. 2. What can I do to make the metatarsal stress fracture heal faster so I can run sooner? Believe it or not many doctors consider zero activity to be a treatment. I personally consider it to be torture. But even if you consider “no running” to be a treatment, that’s only one treatment option. There are dozens of different treatments that can help running injuries heal faster. If you have a stress fracture, a bone stimulator may help really speed up the healing. If you have a plantar plate injury a PRP injection (or platelet rich plasma injection) may help the sprained ligament heal faster. If you have osteochondritis, a stem cell injection may help it heal faster. If you have a neuroma, an alcohol sclerosing injection may be the fastest way to remove the discomfort and get you back to running. But all of these options are considered advanced treatment options and not all doctors will even offer them to you. In fact I have lots of doctor friends who are great people, completely competent, highly trained, and ethical but they’ll never offer these treatments to you simply because your insurance is not likely pay for them. They will openly admit to me, and to you, that they are not going to take the time to discuss these other advanced treatment options if they’ve already decided that you (or your insurance) won’t pay for them. So it’s actually your responsibility, as an injured runner, to learn about these other treatment options so you can then bring them up during the doctor visit and discuss them with your doctor to figure out whether or not any of these advance treatments will help you heal faster. Depending upon your goals, you may be willing to do lots of things that will speed up your recovery by weeks or months. In some cases that’s as simple as having a thoughtful strategy that allows you to decrease the stress and strain on the injured structure so that you can gradually ramp up your activity and continue to run. Again, you just have to be thoughtful about the process, continually re-evaluating, and discussing it with your doctor so you can make sure you’re always moving in the right direction while maintaining your running fitness. 3. How can I tell when it’s safe to run on the stress fracture? This is the million dollar question. 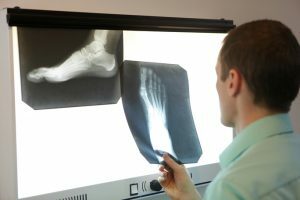 Many patients want to know whether or not there’s a way to get an MRI or an x-ray or some other sure fire method of determining when it is truly safe to run on a metatarsal stress fracture. The current standard of care is to wait for months and then verify that the bone looks completely healed on x-ray. But again, that takes months. I personally believe that on the day you finally get that x-ray that gives you the reassurance that you are safe to run, you probably could have been running on it for weeks or months. But that’s just my personal opinion. My approach is a little different. I believe it is possible to reduce the stress on the specific injured structure enough that you can start to ramp up your activity. This of course requires very specific direction and continual communication between the doctor and the injured runner to make sure you’re reducing the stress enough to tolerate the running. But it is possible. What you really need to understand when you have any discomfort in the ball of the foot that is clearly limiting your ability to run and train is that you have lots of different options. Unfortunately, one of the most common treatment recommendations is to decrease your activity. Of course, that typically means that you should stop running. 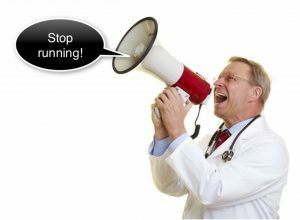 Doctors seem to love to tell runners to stop running. But as I’ve said many times I don’t believe it is always necessary to stop running in order to heal a running injury. You have to think about the overall goal. For most runners the goal is to continue to run. And of course if you’re training for a particular race, the goal is most likely to not only continue to run, but to continue to increase the distance you run as well as the speed at which you are running. All day long I see runners who have developed various running injuries. Some of them are minor. Some of them are severe. Sometimes I see them in person but sometimes we simply do a consultation via telephone, or during a virtual doctor visit over a video web conferencing program. Most runners think that the most important part of the doctor’s visit is to figure out what is wrong and then figure out what the best treatment might be for that particular condition. But that’s just not true. The diagnosis is just a label. That label is only important if you believe there is only one treatment. Just as there is an entire range of potential trouble with stress fractures, there is an entire range of treatments for stress fractures. When I talk to injured runners I always ask them what their particular goal is. Of course my job is to help them figure out how to achieve that goal. My job is never to simply make the pain go away. My task is actually to help the runner work through the injury, make it to the starting line and then make it to the finish line. With that in mind, the majority of the discussion that we have during our running injury consultations is how you can continue to train and run and maintain your fitness. If you have any pain in the ball of the foot try to figure out which of these different conditions may be causing trouble. If you can’t figure it out then make sure that you see a doctor who likes to treat runners. Make sure that you explain your goals. Hold your doctor to the task of helping you figure out how you can run. 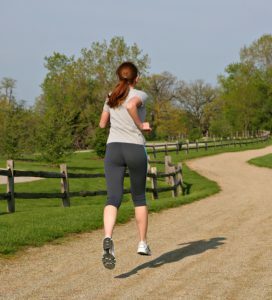 If you ask the right questions and you make it clear that you have no intention of giving up running than you and the doctor can work together and figure out how to get you back to running as quickly as possible.